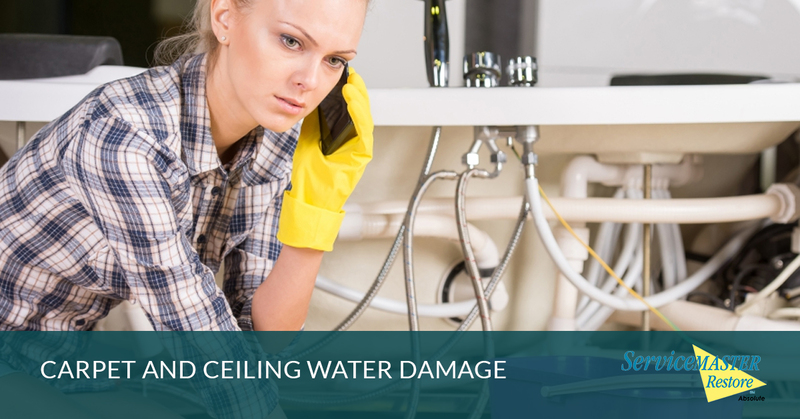 Unfortunately, water damage doesn’t tend to stop on its own. Once you see that your home has any sort of water damage, it is important that you act immediately by contacting a remediation company, such as SM Absolute! We know how to repair your San Diego home and ensure that no further damage is done. When it comes to difficult damage to deal with, we know two of the biggest struggles are the carpet and the ceiling. What do you do when these aren’t in the greatest condition? If you notice that your carpet feels wet or has a wet stain growing, it’s important to give us a call immediately. We will rush to your San Diego home, survey the damage, and advise you to move anything that may be in the way of our clean-up process. We extract any water that may be standing, and then we start our drying and ventilation process. Stop the water flow, if at all possible. We understand that if it is due to outdoor conditions, there is little you can do. Remove any of your personal items and put them in a safe place where the water will not damage them. Remove light furniture and rugs out of the space. Contact SM Absolute in San Diego to come help! Contact your insurance company to discuss your options. Make sure you have as much documentation about the water damage as possible, including photos! Using any electrical appliances near the water damage, including televisions, hair dryers, and more. This can increase your chances of electrocution. Walking on the carpet any more than is entirely necessary. It’s fine to remove your items, but bacteria from your shoes can remain in the water and create the perfect breeding environment for mold. Waiting to deal with the flooding. Mold can begin to grow after just 12 hours and can lead to a serious health hazard for you and your family. If you have a two-story home, you may have water damage on your ceiling from issues on the second story. For example, a leak from a shower can easily cause problems on your lower level ceiling. Even a slight discoloration on your ceiling or the upper corners of your wall is a cause for concern! Mildew can grow within your walls, especially if you choose to paint over the problem instead of addressing it (We’ve seen it happen before!). The problem could be anything from a leaky roof to a burst pipe! If you notice that your ceiling is beginning to sag from water damage, please do your best to stay out of the room. Remove anything from the walls that you may care about, and call our professionals immediately to come take a look! Also, please avoid turning on the ceiling fan, as this may only make matters worse. We will take a thorough look at the space and tell you exactly what needs to be done in order to repair the water damage. Contact SM Absolute in San Diego! Water damage is never fun to deal with, which is why we are here to help. Give our team a call today, and we can be at your door within the hour. We look forward to helping you reclaim your home and restore it back to the way it was!